This is the first book of a still be written series. The target audience for this book is Young Adult-Juvenile.Our young heroes must find the courage to rid their small town of vampire bats that were accidentally released from a local cave.It was a bit corny at times, in a good sort of way.There are a few typos (spelling), but not so much as to be a major distraction.I recommend this story to readers of the Young Adult, Action Adventure, and Children's Horror Genre. I don't care much horror/thriller stories, but I really liked this short story. It did have a typo or two, but nothing serious. This was a young adult thriller about four teens who rescue the remainder of their town after accidently awakening a cave full of zombie bats on a class trip. It even gave a teaser to a sequel. 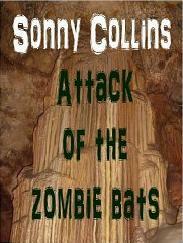 I am looking forward to reading Return of The Zombie Bats!